Southern Star Endemol Pty. Ltd. / Ten Network. x30mins. 2001. CD (ST) BMG. 74321870182. 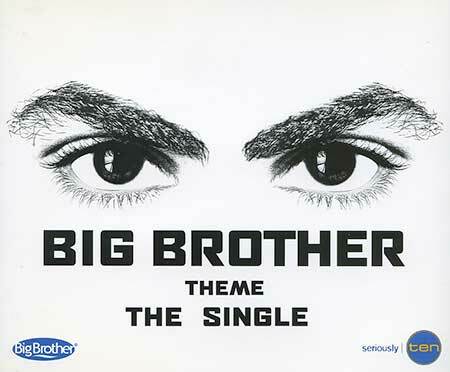 "BIG BROTHER THE ALBUM - MUSIC INSPIRED BY". This compilation 2001 BMG Australia Limited. 01: BIG BROTHER THEME. (RADIO EDIT). 001 Productions. (R.Voerman/P.Post/H.Kourencef). Endemal Entertainment Publishing/BMG Publishing. 2001 BMG Australia Limited. 02: BROKEN BONES (CITY OF LOVE RADIO MIX). Love Inc. (C.Sheppard/Brad Daymond). BMG Music Publishing Australia Pty Ltd. 1999 BMG Music Canada. 03: FEEL THE BEAT (RADIO EDIT). Darude. (Ville Virtanen). Arranged by Ville Virtanon & Jaakko Salovaara. Produced & Mixed by JS16. BMG Music Publishing. 16Inch Records, Finland. Licensed from Central Station Pty Ltd.
04: REAL TO ME (BARCELONA MIX). Lydia Denker. (M.Bainbridge/O.Balwell/J.A.Cocivera/A.Farrugia). Mouth Music/Sunny Delerious/Control. 2000 BMG Australia Limited. 05: THE FINAL (RADIO FLIGHT). Phil Fuldner. (Christian Bruhn). AMCOS Societies. 1998 Kasmo Music GmbH. 06: DIRT (SLAYER EDIT). Death in Vegas. (Richard Fearless/Steven Hellier). BMG Music Publishing Australia Pty Ltd. 1997 Deconstruction Records. 07: SCORCHIO (RADIO EDIT). Sasha/Emerson. (Alexander Cue/Darren Emerson/Charlie May). EMI Music Publishing (Aust) Pty Ltd/Control. 2000 Deconstruction. 08: HE CONTENDER. (MAC MIX / RADIO EDIT). The Mark Of Cain. (John Scott/Kim Scott/Aaron Hewson). John Scott/Kim Scott/Aaron Hewson. 1998 rooArt. 09: THE FALL. Way out West. (J.Kosme/D.Mercer/N.Warren/J.Misternoff/Parsons/D.Prevert). Control 2000 Decanstruction. 10: COME TOGETHER. Spiritualised. (J.Spaceman/Simon Clarke/Clare Connors/Ed Coxon/Tim Sander/Reverand Basil Hughes). Chrysalis Music Publishing (Aust) Pty Ltd. 1997 Dedicated. 11: COMIN' DOWN (PLAYERS REMIX). Bleachin'. (Amos Pizzey). Famous Music/Control. 2000 BMG Euradisc Ltd.
12: TOUCH ME (RADIO EDIT). Rui De Silva. (Rui De Silva/Cassandra Fox). Guitar by Fraser T.Smith. Nottinghill Music/Copyright Control. 2000 BMG Entertainment International UK & Ireland Limited. Licensed from Central Station Pty Ltd.
13: DARLING. Sheila. Layter/MS.Filardi/Layter). Ala Bianca Pub. 2000 Ala Bianca Group Srl. Licensed from Transistor Music Australia Pty Ltd.
14: THE FUTURE OF THE FUTURE (STAY GOLD) (DAVID MORALES RADIO EDIT). Deep Dish with Everything But The Girl. (Deep Dish/Ben Watt). EMI Music Publishing (Aust) Pty Ltd/Sony Music. 1998 Deconstruction Ltd.
15: GIVE A LITTLE LOVE (HAPPY ROBOT MIX). Sirens (Goodson/Wainman). Control. 2001 BMG Australia Limited. 16: TAST-E. (VOCAL MIX - RADIO EDIT). Paul Dakenfold & Andy Gray. (Paul Dakenfold/Andy Gray). Copyright Central/Mushroom Music. 2000 Channel Four Television Corporation. Licensed from Warner Music Australia Pty Limited. 17: THE HOUSEMATES SONG (DON'T YOU THINK THAT'S STRANGE) ORIGINAL RAW MIX. Big Brother Housemates/001 Productions. (Big Brother Housemates). Southern Star Endemol Pty Ltd/001 Music Publishing. 2001 BMG Australia Limited. 18: BROTHER BONUS VIDEO. BIG BROTHER THEME. (PC compatible only). 001 Productions. (R.Voorman/P.Post/H.Koureneef). Endermol Entertainment Publishing/BMG Publishing. 2001 BMG Australia Limited. CD (ST) BMG. 74321866802. "BIG BROTHER THE SINGLE". This compilation 2001 BMG Australia Limited. 1: Big Brother Theme. (3:25). 2: B.B. Uncut Mix. (3:55). 3: The Diary Room Mix. (5:44). 2CD (OP) BMG. 74321945262. 2002. Also CD (OP) BMG. 74321941372. 2002. 01: Big Brother Theme-The Diary Room Mix – 001 Productions. 02: Lockdown - The Mark Of Cain. 03: Hide U – Kosheen. 04: Nothing Lasts Forever - Jebediah. 05: If It Feels Good Do It - Sloan. 06: If You Wanna Be My Friend - Oscarlima. 07: Girls Like That (Don’t Go For Guys Like Us) - Custard. 08: You’re My Mate - Right Said Fred. 09: What Ya Gonna Do - Cry Baby. 10: You’re Not Alone - Olive. 11: Beautiful Sadness - The Lab. 14: Heat Seeking Pleasure Machine - Paulmac Featuring Tex Pe:kins. 15: I’m a DJ (Endorphin Mix) - Sonicanimation. 16: It’s Alright - Chili Hifly. 17: Hit ‘Em Up Style (Oops!) - Blu Cantrell. 18: Maybe Moving In Together Wasn’t Such a Good Idea - Sneeze. 19: Yodelling Mozart – Mary Schneider. 01: Crying at the Discoteque (Ivan’s X Mix) - Alcazar. 02: Be.ANGELED (PVD Club Mix) - Jam & Spoon. 03: Starlight (Dub Version) - The Supermen Lovers. 04: Do You Love Me? (Hai Pong Mix) - Mademoiselle. 05: Tarantula (Rollo & Sister Bliss Funky Mix) - Faithless. 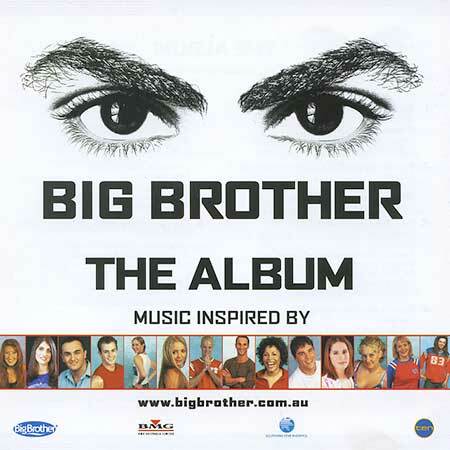 06: Big Brother Theme-B.B. Uncut Mix – 001 Productions.